Taj Mahal seen from our hotel in Agra, India. Band on the streets of Rajasthan, India. When thinking about family trips, at least for families with children over the age of 10, India doesn’t immediately spring to mind. Think again. India has camel and elephant safaris, wildlife refuges, fantastic festivals, renovated forts and palaces, delicious food, and great shopping — especially in the northern state of Rajasthan. My husband and I recently returned from a fantastic trip there. The journey began by taking the train from Delhi to Agra, to visit the Taj Mahal (which is not in Rajasthan per se, it lies right outside of the state border). It’s a short 4-hour train ride, avoiding the traffic of Delhi, and train travel is an important part of the Indian experience. We enjoyed the early morning wait at the train station, the growing hustle and bustle of porters, family and travelers. We had our first but certainly not last cup of delicious masala chai while waiting for the train. In Agra we stayed at a gorgeous hotel (Oberoi Amervillas) which had views of the Taj from every room… talk about a room with a view! Most Indian families go to the Taj Mahal by train, so we did too. 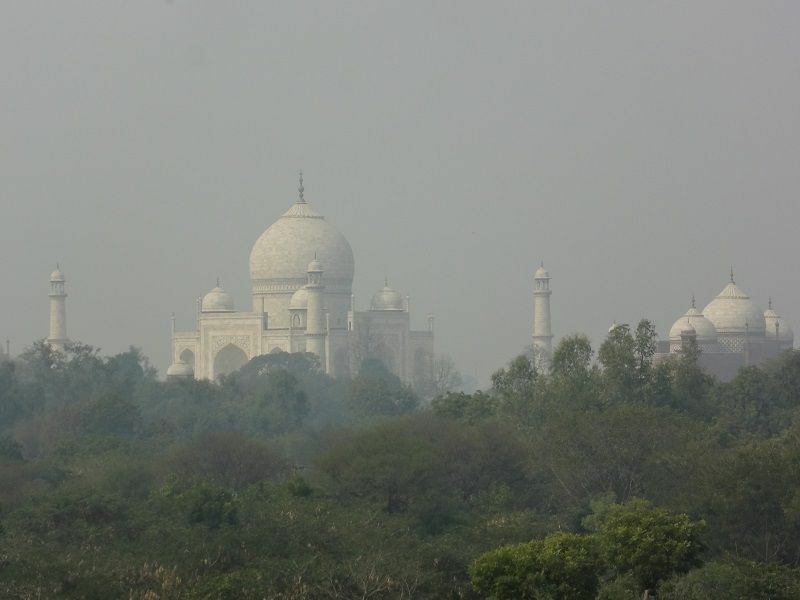 The government has made the entry fee for Indians to the Taj very low ($.20, vs. around USD $10 for foreigners), which is great, tourism should support these gorgeous sites. But it also means that it’s very crowded. It doesn’t matter, the building overwhelms everything and everyone there, and besides, it’s fun to watch the families enjoying themselves at this magnificent site, which does not disappoint. If you can, coordinate your visit with the full moon: they offer a limited number of tickets to visit on the full moon nights (two nights before and after.) You would have to tell your travel agent to try and wrangle some for you, which are made available the day before. We had the tickets but…. it was socked in with fog that night. We gazed at the fog shrouded monument from our hotel room, sighing with frustration. On the drive down to Ranthambore Nature preserve, we stopped for a night at a place called Ramathra, to break up the long drive. It was a long and occasionally bone-shattering drive, but when we arrived at Ramathra, we both agreed it was worth it. Ramathra is a renovated 350-year-old fort, owned by a direct descendent of the original Maharaja who built it. Sitting on top of a bluff, it overlooks a beautiful valley and lake. The hosts organize a stroll to and through a nearby village and shrines, and the fort itself is an oasis of beauty and quiet. Much of the fort has yet to renovated, we loved walking around the ramparts and peering into the decrepit rooms, seeing the faded but still gorgeous wall murals and decorations. From the fort it was a short drive to Ranthambore, the largest tiger preserve in India. It is famously difficult to see these solitary, shy and nocturnal animals. We did see one… but not long enough to get a photo! You’ll just have to believe us. Photos from Ranthambore; our gorgeous guide led us through the desert outside Jodhpur. They took us out on jeep safaris morning and afternoon, in search of the tiger. En route we saw many spotted deer, beautiful birds, many crocs sunning on the shore, and we even saw a sloth bear with two cubs. Also on view in the park is the former hunting lodge of the Maharajah, Ranthambore was his private hunting ground, one shudders to think the number of tigers slaughtered for royal pleasure. Upon our arrival I was chatting with one of the staff. He told us that there were leopards in the park as well (which we never saw). “The leopard is the largest cat,” he told me. Startled, I replied, “Larger than a tiger? Surely not.” He looked at me. “Tiger is not cat. Leopard is cat. Tiger is king.” Before the early morning jeep safari they served hot oatmeal, with or without brandy. A British legacy perhaps?! I had mine with their delicious homemade yoghurt; I can’t face brandy at any time of day. They also bring tea or coffee to the tent with the wakeup call. And then mid-morning during the jeep safari, there is a tea break, in an area frequented by extremely friendly birds (Rufus Tree pie for the twitchers out there), gathering for the crumbs of the tea break. In the evening, for cocktails, we sat around a huge firepit, the area lit by many small oil lamps. From Ranthambore we drove onto Jaipur, one of the storied cities of Rajasthan. We stayed in a haveli (Samode Haveli); havelis were the city mansions of the princes and rajahs. The renovation is absolutely gorgeous, right next to the old city, a.k.a. the pink city, for the color of the buildings. Jaipur is visually stunning, so many images to remember from Samode Haveli. The Samode Haveli, even though it is in the heart of Jaipur, is an oasis of beauty and quiet. The main attraction in Jaipur is the Amber Fort, a magnificent fort completed in the 17th century. It is possible (and great fun) to take an elephant ride up the road to the top of the fort compound. The fort has many courtyards, public and private quarters. The most outstanding areas were the hall of mirrors, (the Sheesh Mahal), housing what were the private quarters of the maharajah and his queen. The walls and ceilings are covered with intricate mirrored mosaic, photos don’t begin to do it justice, and it is a dazzling display of classic Rajasthani craftsmanship. More of beatiful Jaipur; clockwise: Palace of the Winds (Hawa Mahal); Jaipur Fort; Palace of Mirrors. There are other good sites to visit in Jaipur, notably the City Palace, housing a great collection of textiles and weapons. Make sure you check out the clothes of one of the very obese maharajas… they have his pants stretched out in one case. Many of the maharajahs were avid polo players, one of them died during a polo match… literally with his boots on. There is also a gorgeous courtyard, the Peacock Courtyard, with four magnificent painted peacock doorways, representing the seasons. From this courtyard one can see the residence of the royal family, still in use today. The Maharajah who built the city was also fascinated with astronomy. There is an amazing large astronomy park, full of oversize, extremely accurate astronomical instruments, constructed out of marble, some of which can calculate the time to within 2 seconds. 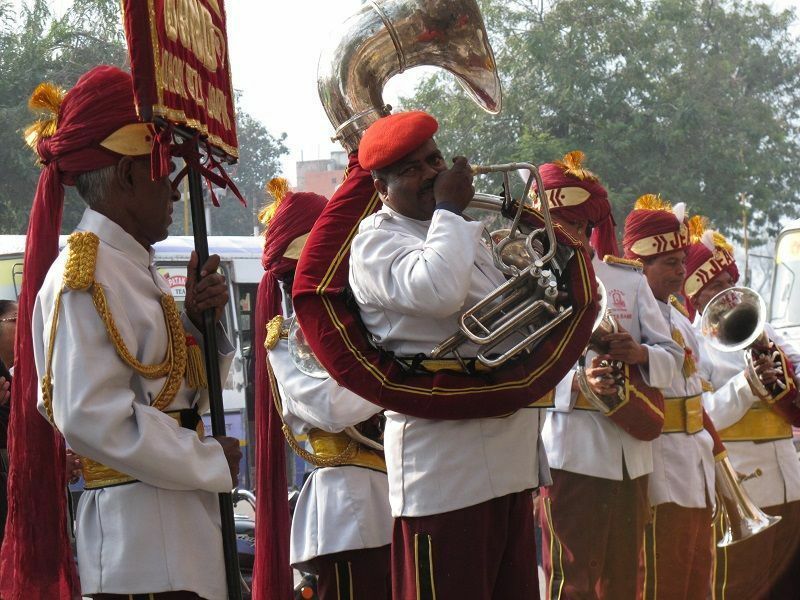 During our early morning stroll through the pink city, we happened upon a large brass band playing, but we couldn’t see a wedding party. Inching closer, we saw that they were playing a rousing welcome to the young priest opening up the local Ganesh shrine (the elephant god of good fortune). Continuing our stroll, we came upon (of course) some snake charmers. Walking around the markets is a must when in India, there is so much to gaze upon, smell, listen and enjoy, we did it at every opportunity. The extra added attraction is the gorgeous clothing of every woman, of all ages and sizes. Vibrant gorgeous fabrics, everywhere you turn. From Jaipur we drove to Nagaur, which has both a Sufi music festival, and a famous cattle market, neither of which coincided with our schedule, but good to know about. A collage of great memories: birds in Ranthambore; elephant ride in Jaipur; forts of Naguar. After another long and bumpy drive, we arrived at Ranvas Hotel, which is a boutique hotel built within the grounds of the magnificent Ahhichatragarh Fort (Fort of the Cobra’s Hood), owned by the Maharajah of Jodphur. Built in the 12th century, the hotel sits in what were the quarters for the queens — 16 rooms with their own courtyards. The fort itself fell into disrepair, but the current Maharajah has created a foundation to repair it,. There is a fascinating before and after exhibit showing the renovations which have been underway since the 1990s, with support from the Getty Foundation. There were also many peacocks roaming around, we saw peacocks everywhere in Rajasthan, and learned the interesting fact that after the mating season males shed their gorgeous tails, and then regrow them every year. Our journey finished in Jodphur, also known as the blue city, for the color of many of the buildings, and the origin of jodhpur riding pants. When Sir Partap Singh went to London in 1897 for Queen Victoria’s Golden Jubilee, the ship carrying his clothing sank. He quickly went to Savile Row and had a fresh pair of jodphurs made up. The sensibly designed riding pants were a big hit with the British aristocracy, who rushed to Savile Row to get their own made… hence jodphurs. So successful were the pants, that a new boot, jodhpur boot, was invented just to go with the pants. This is the view of Jodphur fort from our hotel, Raas Jodphur. The mighty fort is well worth a visit. There are various staterooms, pleasure rooms, private and public quarters, an array of ornate howdahs (for elephant processions) and baby cradles are among the sights you can see. And as usual, there’s a great market to stroll through. We were sorry to leave, there was still so much to see. We’ll just have to go back again! Since India is so large, it makes sense when planning to pick a region: the South, the East, West, it’s too big to fit it all in a single visit. It will make for a more relaxing and focused journey. When planning a trip to India, there are two important considerations for when to go: weather or time of year, and festivals. In our case, our timing was determined by work: my husband had a conference in New Delhi in February, so we decided to take advantage of that and organize a trip right afterwards, and Rajasthan was the logical choice, since it is next door. February is a great time to go to India, the weather is pleasantly warm during the day (in the 60s), and cool at night. It is also the wedding season, so you will see and hear many wedding processions in the streets, hear the music and drums, and see (and hear) many fireworks at night. Owing to the conference dates, we narrowly missed some good festivals in Rajasthan at that time. Getting around is part of the experience. We traveled using trains, car and driver, and planes. Depending on the amount of time you have, and your budget, you can decide how to juggle all of that. For some of the places we went to, a car and driver was the only option. There are also some famous luxury trains which travel through Rajasthan, we didn’t have the time (or budget) to indulge in those, but we hear from friends they are well worth checking out. TIP: If you are doing a road trip, check whether the car or driver have GPS, and if not, see if they can provide you with one for additional charge. Road signage is poor in India, you and your driver will be more relaxed if there is GPS (which is not standard, but the maps are very good). We also recommend using a local travel agency to help you plan your journey. India can be a challenging place to negotiate, internet is intermittent, using a travel agency (we used Thomas Cook International, referred to them by Indian friends) can make the whole experience very relaxing. They met us every step of the way, and ensured smooth transfers everywhere. Their local guides were very good, we were delighted with them. India is endlessly fascinating and photogenic. Go and enjoy!